Standish is a large village in the Metropolitan Borough of Wigan, Greater Manchester, England. Historically in Lancashire, it is on the A49 road between Chorley and Wigan, near Junction 27 of the M6 motorway. The population of the village was 13,278 in the 2011 census. Formed around a crossroads, the village has grown as urban expansion between Manchester and Liverpool extends outwards. The Church of St Wilfrid is a Grade I listed parish church. The name Standish is derived from the Old English stan, meaning stone, and edisc, a park or enclosure. It has been variously recorded as Stanedis in 1206, Stanediss in 1219, Standissh, Stanedich and Stanedissh in 1292 and Standisch in 1330. The adjoining village of Langtree was recorded as Langetre in 1206 and Longetre in 1330. A Roman road passed through the township. Standish and Langtree were part of the Penwortham barony in the 12th century, and between 1150 and 1164, Richard Bussel, Lord of Penwortham gave them to his brother-in-law Richard Spileman. In 1212 Thurstan Banastre held them and later they were held by William de Ferrers Earl of Derby, and then by 'the lords of Leylandshire'. The tenants adopted the local surnames, Standish and Langtree. From the 13th century, the Standish family were Lords of the Manor of Standish and owned the Standish Hall estate. The male line ended in 1755 with the death of Ralph Standish, and the estate was passed down through female lines until it was broken up in 1920. Standish Hall was sold to an American buyer in 1921 and later demolished. With the oldest part, constructed in 1574, transported and rebuilt in the U.S.A. The Standish family were the main coal owners in the area, with their estate being mined since the 14 century. Coal mining in the area increased during the Industrial Revolution. During 1865-1866, the Standish collieries were merged into the Wigan Coal and Iron Company. By 1896, Wigan Coal & Iron owned the Broomfield, Giant's Hall, Gidlow, John, Langtree, Robin Hill, Swire and Taylor Pits. The largest of these was the Langtree Pit with over 540 employees. In 1900 the two 20ft shafts of Wigan Coal's Victoria Colliery were sunk. This would continue to operate until its closure by the National Coal Board in 1958. It is now a housing estate. The village was formerly served by the Standish railway station and the Boar's Head railway station on the West Coast Main Line, which both closed in 1949. Lying within the historic county boundaries of Lancashire since the early 12th century, Standish emerged as a township in the Middle Ages but by the mid-19th century was united with neighbouring Langtree, as Standish-with-Langtree. The township was in the larger Standish ecclesiastical parish. Following the Poor Law Amendment Act 1834, Standish-with-Langtree formed part of the Wigan Poor Law Union, an inter-parish unit established to administer the Poor Law which made use of premises on Frog Lane Wigan and Hindley. Standish-with-Langtree became a local board of health established in 1872; Standish-with-Langtree Local Board of Health was a regulatory body responsible for standards of hygiene and sanitation in the township. Following the Local Government Act 1894, the area of the local board became an urban district within the administrative county of Lancashire. 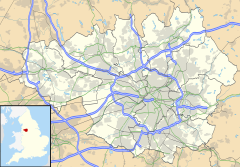 Under the Local Government Act 1972, the Standish-with-Langtree Urban District was abolished, and Standish has, since 1 April 1974, formed an unparished area of the Metropolitan Borough of Wigan, a local government district of the metropolitan county of Greater Manchester. For electoral purposes, the village is within the Standish With Langtree Ward. The resident's group Standish Voice, a residents' group formed in July 2014. In May 2015, it was designated as the Neighbourhood Forum for Standish, with the aim of creating a Neighbourhood Plan for the village. As part of their commitment to the community, Standish Voice organised the first ever Christmas market to be held in the village, which took place on 3 December 2016. Standish lies to the south and Langtree to the north of the area, Standish covering 1,696 acres, and Langtree which had two separated portions, 1,568 acres, a total of 3,264 acres. The River Douglas and Bradley Brook form the boundary on the eastern side, the Mill Brook which flows into the Douglas forms the western boundary. Standish is situated on a ridge of high land which rises to 370 feet and runs north to south across the township, near the river the land is between 120 and 160 feet. The underlying rocks are the coal measures of the Lancashire Coalfield. Standish has a population of 13,278 people, based on the 2011 census, this represents 4.2 per cent of the population of Wigan Borough. There is a higher than average amount of residents over the age of 65, with 19.9% the population. It is an affluent community with seven out of the nine areas appearing within the top 30 per cent most affluent in England. Eighty per cent of residents own their homes or have a mortgage; only 10% of households live in social housing. The Parish Church of St Wilfrid is the only Grade I listed building in the Metropolitan Borough of Wigan. There are 22 Listed buildings in Standish with one at Grade I and two at Grade II. St Wilfrid's Parish Church is the only building with a Grade I listing in the Metropolitan Borough of Wigan. In the Market Place in front of the church is a late medieval cross, stone stocks and a 14th-century well. The village has two war memorials, one at the Methodist church and the other, Standish Pillar War Memorial, in the Victoria Jubilee Memorial Garden (near the Globe pub); this includes the names of those lost in the two World Wars. Standish is on the Wigan to Chorley bus route with the Arriva 362 and Stagecoach 113 buses stopping every 20 minutes. It also has the 640 and 641 Standish Circular by Diamond Buses. ^ a b c "Standish Community Profile" (PDF). Wigan Council. ^ a b c d e "Greater Manchester Gazetteer". Greater Manchester County Record Office. Places names – S. Archived from the original on 18 July 2011. Retrieved 17 June 2008. ^ Ekwall, Eilert (1972) . The Place-Names of Lancashire. Wakefield: EP Publishing. p. 127. ^ "Standish Family & Estate Records". Wigan Council. Retrieved 15 April 2019. ^ a b "Standish & Coppull". Northern Mine Research Society. ^ Historic England. "Standish Hall (41975)". PastScape. ^ "Victoria Colliery". Northern Mine Research Society. ^ "Standish Neighbourhood Plan". www.wigan.gov.uk. Retrieved 16 December 2016. ^ "Christmas Market - Standish Voice". Standish Voice. Retrieved 16 December 2016. ^ "Listed Buildings in Wigan Borough" (PDF). Archived from the original (PDF) on 27 March 2009. Retrieved 15 December 2007. ^ Historic England. "Standish Pillar War Memorial (1426126)". National Heritage List for England. Retrieved 10 January 2018. ^ "Bus routes". Transport for Greater Manchester. Wikimedia Commons has media related to Standish, Greater Manchester.